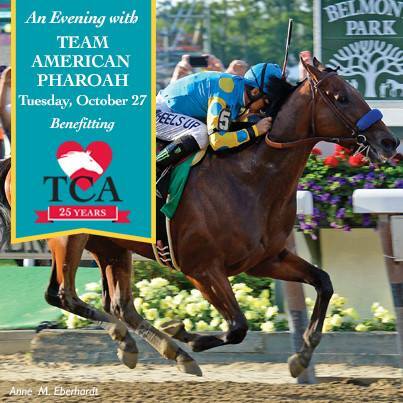 LEXINGTON, Ky. – Thoroughbred Charities of America announced today that it will host a fundraising event entitled “An Evening with Team American Pharoah” on Tuesday, October 27 from 7-9 p.m. at Fasig-Tipton in Lexington, Ky. Horse Racing Radio Network’s Mike Penna will host as Justin and Ahmed Zayat and Bob Baffert recount their thoughts about the history-making career of Triple Crown Champion American Pharoah. All proceeds will benefit Thoroughbred Charities of America. “We are excited to kick off an exciting Breeders’ Cup week in Lexington with TCA’s An Evening with Team American Pharoah. We look forward to sharing our thoughts about this great year all while benefiting an important charity,” said American Pharoah’s owner Ahmed Zayat. “We are honored to spend an evening with this incredible team and hear from them about the thrilling year they have had with the amazing American Pharoah, while raising money for TCA,” said Erin Crady executive director. Limited tickets are available for $75 per person here or by calling 859-276-4989. Cocktails and hors d’oeuvres will be provided. Sponsors include Fasig-Tipton and Woodford Reserve. Sponsorship opportunities are still available. TCA distributes grants to several categories of Thoroughbred-related nonprofits including retirement, rehabilitation and adoption organizations; backstretch and farm employee programs; therapeutic riding programs; and research organizations. TCA has granted over $21 million to more than 200 charities since its inception in 1990. TCA grants funds to organizations that successfully meet the criteria set forth in its annual grant application. TCA’s mission is to provide a better life for Thoroughbreds, both during and after their racing careers, by supporting qualified repurposing and retirement organizations and by helping the people who care for them. TCA raises money for distribution to charitable organizations that work to uphold its mission. From 2000-2014, more than 95% of TCA’s expenditures were allocated to program services including direct grants. Donations to TCA are always accepted and can be made as direct donations or as donations in lieu of flowers, birthday gifts or other occasions. TCA’s largest annual fundraiser is a Stallion Season Auction held each January. For more information please visit www.tca.org. TCA is the charitable arm of the Thoroughbred Owners and Breeders Association (TOBA). Older Post"Dark Horses & Longshots" by Templeton Thompson now available for download!